Teachers often tell me they find it difficult to engage all students in their classes. I agree – it’s tricky to encourage all students (whether they be shy or bold) to join in discussions. The first thing I suggest teachers try is to create a learning environment where every student feels comfortable and respected when they share ideas and speak up. I have used this strategy with students, teachers and corporates to begin lessons in countless classrooms and workshop setting over many years. It works a treat. Sharing your ideas is risky business. What if people don’t like your ideas? What if your answers are ‘wrong’? What if you can’t explain your thoughts and end up looking silly and people laugh? These are all valid points that every student feels in every lesson when asked to contribute. However, some students are better at taking the risk than others. To encourage all students to become risk-takers and contribute to discussions, I do the following: I ask them to point to themselves and say, “I am not an expert”. Some of the students find this a bit difficult but they warm to the idea when I invite them to point to their peers and say, “You are not an expert”. This external assessment they seem to find very easy! I then ask them to point at me and say “He is not an expert either!”. I then explain that since we have established an “Expert-Free Zone”, they are no longer to worry about being wrong and can now concentrate on the business of learning, which involves making many mistakes. I also make it clear that a thinking environment demands total respect for the feelings of others and that destroying or damaging the self-esteem of others is basically criminal since it suffocates and prevents good learning. I point out that if they make a mistake in class, the sun will rise tomorrow. So, relax! So, teachers, why don’t you give this a try! 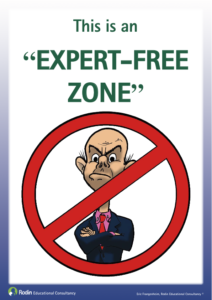 It’s best to establish this ‘expert-free zone’ at the beginning of the year or term to set the tone for your thinking classroom from the get-go, but you can also reiterate it at the start of a new lesson or a new project. It’s never too late to create the values for your thinking classroom. NOTE: This strategy is an excerpt from my best-selling book, “Reflections on Classroom Thinking Strategies: How to create your thinking classroom with 42 practical and engaging thinking tools” (11th edition, newly released). E-book coming soon! Visit our shop to buy the print version today.